A cyclist's biggest threat? Definitely the knobs in cars who don't look properly, risking a dangerous accident where, as is common, the cyclist will come off far worse than the front end of their Audi TT. 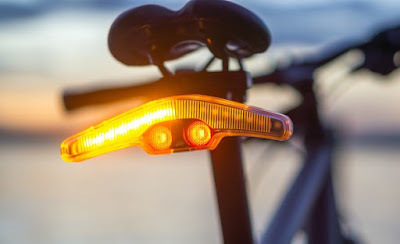 To stay as safe as you can on the road while cycling, you need to be seen. We've reviewed lots of clever of bike lights in the past, but these certainly 'stand out'. That's a light pun. Anyway, we check out Blinkers bike lights. This is a single lighting unit that contains three different lights; one to indicate that you're turning left, one for right, and also a brake light. 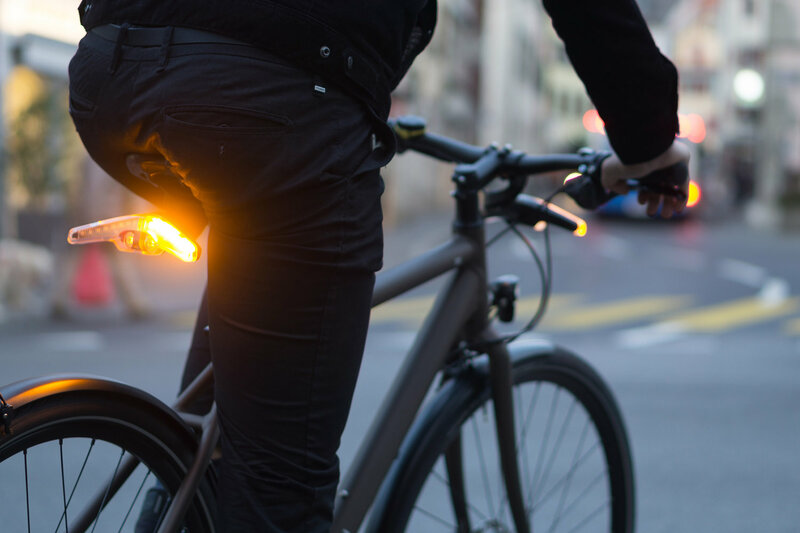 Such illumination is usually only reserved for cars, but Blinkers let you display very clearly your intentions of movement while on a bike. 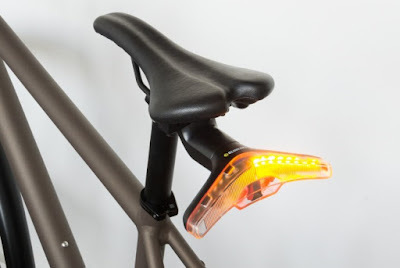 So, indicators for your bike, eh? How does that work? Well, Blinkers come with a wireless control panel, designed to attach to your handle bars. Once paired with the light set itself (whcih is charged via USB, we hasten to add), you can easily hit the left or right indicator button to get the relevant light flashing. This it will do for 12 seconds, or until you tap the same button to switch it off. Once fixed to a comfortable spot on the bars, reaching your thumb out to hit one of the buttons is very easy and intuitive. You can very clearly feel which is left and which is right, so there's no need (after a few practice goes) to look away from the road to the controller. It just works, which is good. The brake light is completely automatic, and we think we love it more than being able to indicate. Once the Blinker unit detects sudden deceleration, it flashes up the bright red light, situated underneath and between the indicators. In use, we noticed that cars behind us kept a far better distance during braking moments, as the light gave the motorists the ability to better judge our distance. We've been mostly testing it at night (what with it currently being summer here in the UK), but we feel Blinkers would offer a huge amount of confidence when used in the dark and bleak conditions of winter. Overall, Blinkers not only made us more visible on the road, but also made us feel safer as cars could better predict our movements. Indicating in good time for a turning meant those behind didn't attempt to overtake, and we could leave both hands on the handlebars for braking for longer, without physically signalling. Oh, speaking of which, it does state in the instruction manual that you should still signal with your hands, just to make sure motorists fully recognise that you're turning. Makes sense. 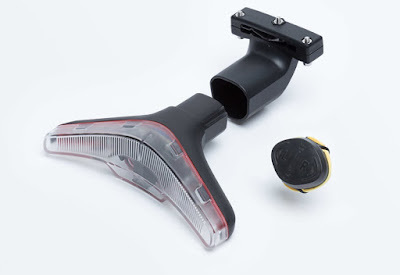 We tested the bog-standard rear Blinker unit, but you can also get a set for both front and rear, and also versions for a bit more cash with a built-in laser projector that beams a semi-circle around you, encouraging others to keep their distance. 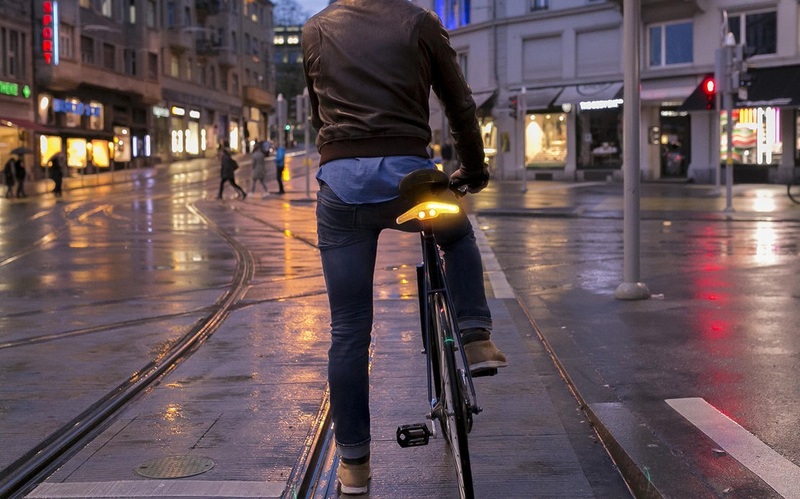 That looks cool, but we're more than happy with the brake light and indicators. Combing several useful lights, and innovations, into one magnetically attaching, wireless-controlling package, we're big fans of Blinkers.